Pioneers in the industry, we offer half threaded studs, double end stud bolts, stud bolt, weld studs, stud bolts with reduced shank and flange stud bolts from India. Size Any (As Per Your Requirement). Manufacturer, Exporter & Suppliers Of Half Threaded Studs In India. 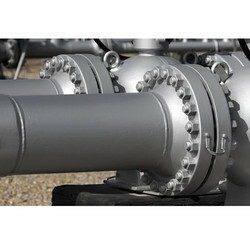 Stud bolts implied for bolting pipeline flanges, are called flange stud bolts. These flange studs have continuous threaded body and chamfered ends. Engagement length is considered from first threaded to last thread, excluding the chamfered ends. One of the dimension standards for flange stud bolts is ANSI/ASME B16.5. Length calculations are done according to the size and pressure-temperature ratings of the flange. Flange stud bolt dimensions are defined in both metric and imperials sizes with unified national coarse pitch (UNC), fine pitch (UNF), fixed pitch (UN) and iso metric thread profile. These are produced across all material categories and astm specifications. 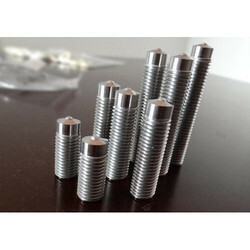 Manufacturer, Exporter & Suppliers Of Double End Stud Bolts In India. Double end stud bolts are threaded rods with equal thread length at both ends. Tap end studs are also sometimes referred as double end stud bolts. Double end stud bolts have plain shank equal to that of the nominal diameter. Double end studs are used for high strength bolting. Further one type of double end stud bolts have reduced shank diameter as designed for special bolting. DIN 2510 is specification for double end stud bolts with reduced shank. Double end stud bolt dimensions are defined in both metric and imperials sizes with unified national coarse pitch (UNC), fine pitch (UNF), fixed pitch (UN) and iso metric thread profile. These are produced across all material categories and astm specifications. Nut Type HEX ANY (AS PER YOUR REQUIREMENT). Washer PLAIN ANY (AS PER YOUR REQUIREMENT). Manufacturer, Exporter & Suppliers Of Stud BoltsIn India. Stud bolts implies to plain threaded rods with full body thread coverage. Full threaded stud bolts are used with 2 regular or heavy hex nuts. Fully threaded studs comes with chamfered and non-chamfered ends. Chamfered stud bolts are used for bolting flanges where length of engagement is considered from first to last thread and calculated as per ANSI/ASME B16.5 or other respective flange standards. Plain non chamfered stud bolts are often used for general bolting and cut from large threaded rods for simplicity. Fully Threaded stud bolt dimensions are defined in both metric and imperials sizes with unified national coarse pitch (UNC), fine pitch (UNF), fixed pitch (UN) and iso metric thread profile. These are produced across all material categories and astm specifications. Size ANY (AS PER YOUR DIMENSION). Manufacturer, Exporter & Suppliers Of Weld Studs Bolts In India. Weld studs are studs bolts or studs with threads at one end and other non-threaded end for welding purpose. Thread engagement length for welding studs can be determined by the application. Welding studs are defined by AWS Standard D1.1. Shear stud connector or stud connector are other variants of welding studs. Welding stud dimensions are defined in both metric and imperials sizes with unified national coarse pitch (UNC), fine pitch (UNF), fixed pitch (UN) and iso metric thread profile. These are produced across all material categories and astm specifications. Browse the page for information on welding stud manufacturing process, forming method, available sizes, sub-types, thread types, metric and imperial dimension standards, weight charts, torque values, material categories, grades and astm specifications. Coatings GI,PTFE (Teflon),Hot Dip Galvanizing,Zinc Phosphating,Nickel Plating. Manufacturer, Exporter & Suppliers OfStud Bolts With Reduced ShankIn India. 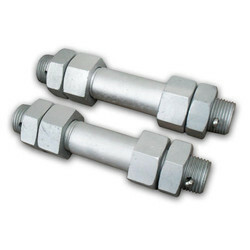 Stud bolts with reduced shank implies to double ended stud bolts with reduced shank diameter for high strength bolting. DIN 2510 is prominent dimension standard for these bolts. These are special type of studs. Stud bolt with reduced shank are manufactured in high tensile alloy steel, carbon steel, stainless steel grades and all major astm specification. Dimensions for reduced shank stud bolts are defined in both metric and imperials sizes with unified national coarse pitch (UNC), fine pitch (UNF), fixed pitch (UN) and iso metric thread profile. These are produced across all material categories and astm specifications. Manufacturer, Exporter & Suppliers Of Flange Stud BoltsIn India. Manufacturer, Exporter & Suppliers OfTap End Stud BoltsIn India. Tap End Stud Bolts are threaded rods with short thread length at one end, called the tap end for engagement with tapped machine hole, while the other end is longer for engagement with nut. Tap end studs are special stud bolts required for custom bolting requirement. Dimensions for tap end studs are defined in both metric and imperials sizes with unified national coarse pitch (UNC), fine pitch (UNF), fixed pitch (UN) and iso metric thread profile. Manufacturer, Exporter & Suppliers Of Threaded Rods In India. Fully threaded stud bolts implies to plain threaded rods with full body thread coverage. 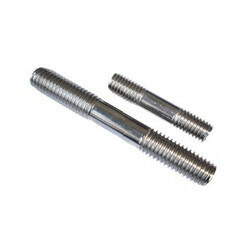 Full threaded stud bolts are used with 2 regular or heavy hex nuts. Fully threaded studs comes with chamfered and non-chamfered ends. Chamfered stud bolts are used for bolting flanges where length of engagement is considered from first to last thread and calculated as per ANSI/ASME B16.5 or other respective flange standards. Plain non chamfered stud bolts are often used for general bolting and cut from large threaded rods for simplicity. Fully Threaded stud bolt dimensions are defined in both metric and imperials sizes with unified national coarse pitch (UNC), fine pitch (UNF), fixed pitch (UN) and iso metric thread profile. These are produced across all material categories and astm specifications. 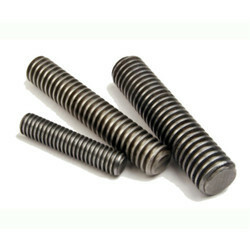 Manufacturer, Exporter & Suppliers Of Fully Threaded Stud Bolts In India. 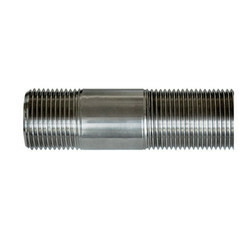 Fully threaded stud bolts imply to plain threaded rods with full body thread coverage. Full threaded stud bolts are used with 2 regular or heavy hex nuts. Fully threaded studs come with chamfered and non-chamfered ends. 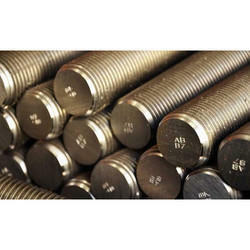 Chamfered stud bolts are used for bolting flanges where the length of engagement is considered from first to last thread and calculated as per ANSI/ASME B16.5 or other respective flange standards.